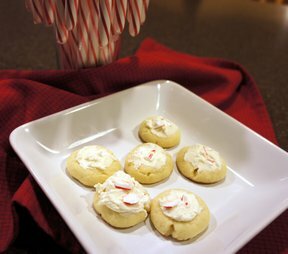 A melt in your mouth sweet treat for Christmas! Preheat oven to 200 degrees F and place the rack in the center of the oven. Line a baking sheet with parchment paper. 3. Place the mixture in a large zip lock bag and cut the corner about an inch length wise to squeeze the mixture out and onto the parchment paper. Squeeze mixture out into the shape of candy canes. 5. Bake the meringues for approximately 1 1/2 to 1 3/4 hours, rotating the baking sheet from front to back half way through to ensure even baking. 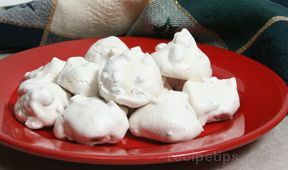 The meringues are done when they are pale in color and fairly crisp. 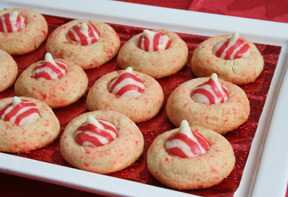 Turn off the oven, open the door a crack, and leave the meringues in the oven to finish drying overnight.